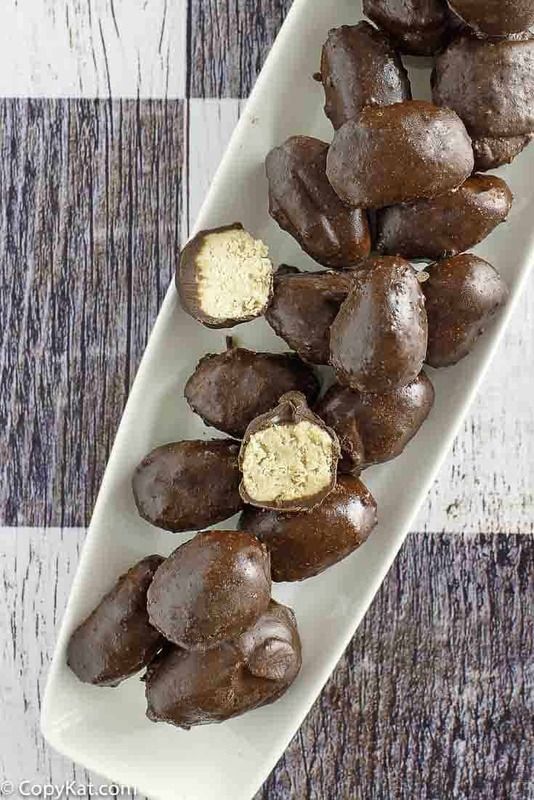 Make your own Reeses Peanut Butter Eggs from Scratch! Reeses Peanut Butter Eggs are a staple of many Easter baskets. When I was growing up, I didn’t think an Easter basket was complete until there was a few of these tucked inside. Now you can recreate this Easter classic from scratch with this copycat recipe. Sure, you can buy these pretty much everywhere. Why would you want to make these at home? You can make changes that you might like. For example, I love, dark chocolate. You can recreate these with dark chocolate. You could also use some of your favorite peanut butter. Feeling extra healthy? Maybe your grocery store grinds their peanut butter fresh, you may want to use their peanut butter. Honestly, it’s just fun to recreate copycat recipes at home. Why Not Just Buy Reese’s Peanut Butter Eggs? If you love, dark chocolate, you can recreate these eggs with dark chocolate. You can choose to dip some or all of your eggs in white chocolate for a different look. You can use your favorite peanut butter. If you prefer crunchy peanut butter, you can make your eggs crunchy. Feeling extra healthy? Maybe you want to use the fresh peanut butter your grocery store grinds? You might want to swap the peanut butter for almond butter or cashew butter. Good idea if a family member has peanut allergies. If you don’t want eggs, try chilling the mixture, rolling it out, and using a cookie cutter to form any shape you want. Then dip your shapes in the chocolate. If you enjoyed this recipe you may want to take a look at these for Easter. One of my favorite combos is peanut butter and chocolate - I classify these two as “food groups”! You don’t have to restrict yourself to Easter; you can make Reese’s eggs year round. 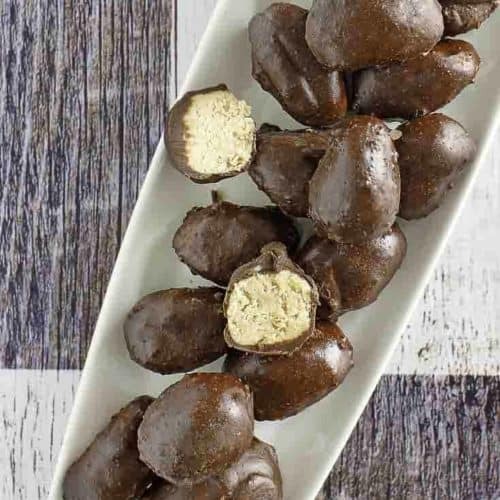 Everyone loves these peanut butter eggs and your kids will go crazy over them. They are so good! In a medium-sized bowl combine peanut butter and butter together with a mixer. Add powdered sugar and vanilla. Shape the eggs by using 1 tablespoon of the peanut butter mixture and hand shape into an egg shape. 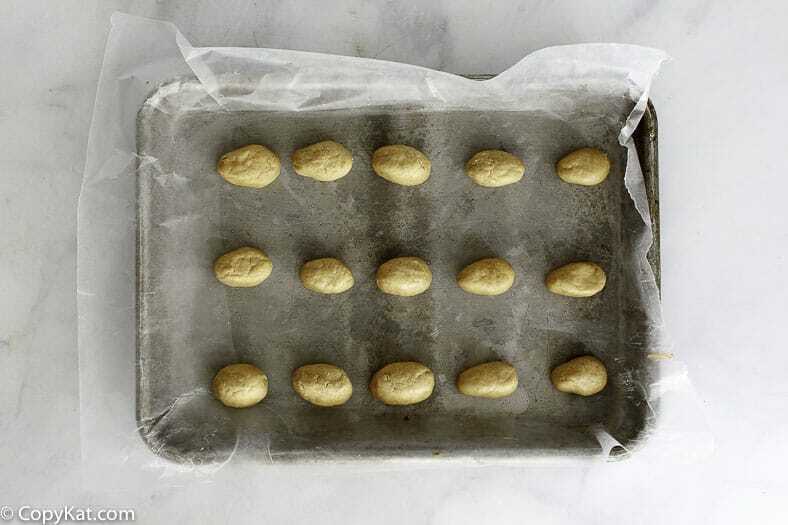 Place eggs on a cookie sheet lined with waxed paper. Refrigerate eggs for about 30 minutes before coating with chocolate. Melt chocolate in a double boiler, or in a microwave in 30-second increments. Add 2 tablespoons of butter to the chocolate and stir to combine. When the chocolate/butter has fully melted, set aside. 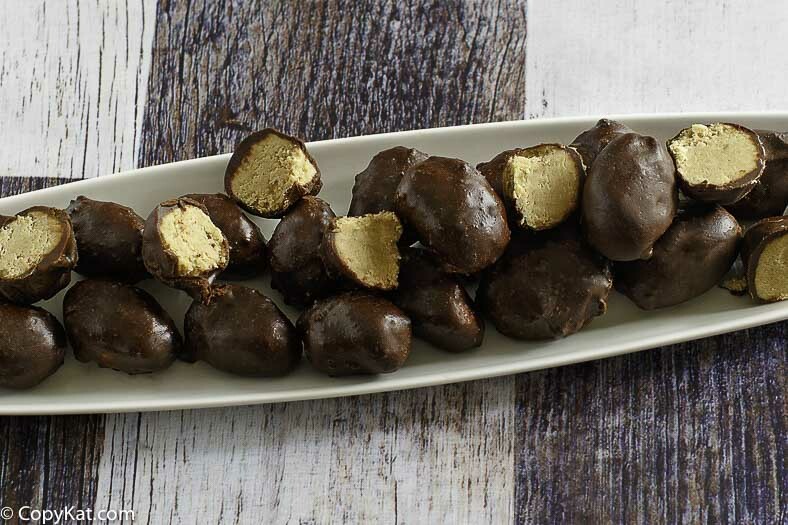 Remove peanut butter eggs from the refrigerator and gently dip each one into the chocolate. Place the dipped eggs onto the waxed paper. Allow the chocolate to set. Once the chocolate has set, the eggs are ready to be enjoyed. My kids can’t stop eating these! They are so good! Reese’s eggs are my favorite! This recipe is spot on! I like these with crunchy peanut butter. This is SO much better than the storebought stuff. Great recipe! Perfect copycat to make at home! How was it? I would love a copy kat for Baskin Robbins peanut butter and chocolate ice cream. Substitution.with the butter and coconut. Looking forward to making this recipe. Would the powdered peanut butter mixed with water work? I am not sure, I think it may work ok. The confusion is in the grammer, and can be clarified by saying: “You may substitute 2 tablespoons of coconut oil for the 2 tablespoons of butter in the coating.” In other words, you substitute the new ingredient FOR the old ingredient, or you substitute the old ingredient WITH the new ingredient. Hope that helps. Thank you. I will correct this error. Actually, Janet, you made your own typo. Grammar is “ar”, not “er.” Grammar. Since I have been following you, I have tried several of your recipes. They have all been easy to make with GREAT results. I can’t wait to try the peanut butter eggs, one of my favorite combos is, peanut butter and chocolate, I classify these two as “food groups”!